* Bring your lawns to life. On this page I outline several styles in growing lawns. You can learn about the finest stately looking lawns, hard-wearing functional play lawns or dare to be different with perhaps the most beautiful natural lawns. To find practical information on lawn mowers, - mowing grass, - organic lawn care routine, and the value of growing organic lawns - click these links. Yet the most attractive and user friendly are perhaps the flowering lawns and scented lawns. And they add huge wildlife value to your neighbourhood - bees, hoverflies, and butterflies will be busy-busy feeding from the small flowers growing with your beautiful grass. So before laying the foundation for a new organic lawn let's consider the alternatives in detail. Click a selection to read more about growing lawns in your favourite style. The pride and joy of many gardeners - neatly edged ornamental lawns are weed-free, richly greened up, and with a uniform and even surface. They are created by growing lawns with fine leaved grasses. 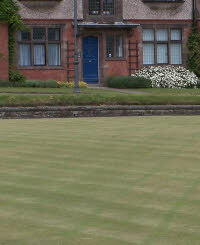 Putting, bowling and croquet greens are levelled to perfection and cross mown for an even finish. Regular ornamental lawns and picnic lawns may be stripe mown and they are well located front-of-house where they can be viewed on approach or from windows. But ideally they should not be walked on. With straight edges the border planting tends to be formal. The regimented stature of Tulips, 'Candelabra' Primulas and Delphiniums stand out well. Along curved edges, the space unfolds around medium to large tight-knit mounds of well-trimmed shrubs or herbaceous plants. Rose borders are popular too with spacious areas of mulched earth in between. And fine lawns unify their surroundings to connect and harmonise drives, patios or pools with your flowers. contribute to roots bulging up in the lawn. But trees have the potential to spoil such lawns. That's because they compete strongly for water during summer months and exacerbate the droughts that cause conspicuous browning. Dry and shade may combine to cause problems when growing lawns that are lined by trees. Always prevent shrubs from over hanging your turf. These conditions are better tolerated by starting out with a suitable grass seed mix for shade. Nevertheless, a fine lawn strewn with confetti from the pink and white petals of wind blown cherry blossom remains one of the most beautiful sites in spring. Fine lawns require mowing and edging several times a week in the growing season, plus organic feeds spring and autumn to keep them green. Attention to aeration and drainage is also required depending on soil conditions. And if moles are present they will be intolerable intruders. You can find more practical help for growing lawns of fine grass lawn maintenance and lawn mowing machines on the-organic-gardener.com. When your family needs a children's play area around the home - for ball games, tennis, football etc… you'll want to be growing lawns of tough grass. And when you want to make pleasant green pathways down your garden you'll need to think about compaction and wear. That's why tough Rye grass that spreads quickly to fill in gaps is used when growing lawns for utility purposes. Note that the latest seed mixes contain a fine leaved rye grass to give the appearance of a fine ornamental lawn but with the toughness of a utility lawn. Play lawns are well placed further away from the house where disturbance and damage to windows from ball games can be limited. Utility lawns may also be put down as garden pathways. Find more information on selecting lawn seed, avoiding compaction and lawn maintenance here. Few gardeners manage to break away from the conventional plain green lawn. The weed and moss killer industry thrives on this perception. Yet they too concede the value of planting beginning and end of season flower bulbs in your lawn. And wouldn't you agree that a carpet of small flowers is even more beautiful than plain grass? Because low growing and spreading wild flowers such as thyme, bird's foot trefoil, self-heal, chamomile, ladies bedstraw, daisies, yellow pimpernel (lysimachia nemorum), black-medic, and clovers will mix beautifully into fine lawn grass that's mown. You get a changing patchwork of colour that perfumes the air in sunshine and when mown or walked on. And your wild flower lawn becomes quietly busy as it attracts hundreds of bees and butterflies to your organic garden. There's no need to add fertilizer. Flowers such as clover and medicago produce root nodules that fix nitrogen. So this kind of lawn brings natural fertility. You need to use fine leaved grass and keep the lawn mowed. You need to remove weeds, sow grass seed thinly, avoid using fertilizer and mow in rotation but after flowering. The above plants are perennials. Weed the ground before sowing grass and flower seed thinly. Avoid fertilizers. You will get a tall flowering meadow. Mow after flowering and seed setting, using a scythe or flail cutter and leave some hay to lie. Check out my advice on making a stale bed to remove weeds. Choose perennial flowers and heed the advice above about selective mowing and setting seed. You might also scratch compacted soil under the hay to open it up to seeds. If you want to retain all the flowers in your original seed mix you may have to re-sow every few years. I find that growing lawns with low spreading flowers included is less effort and well worth it for their beauty and wildlife value. Camomile is exquisitely fragrant when walked on or cut. Thomas Hyll had the right idea when in 1577 he suggested using Camomile for “benches to sytte on”. But you can easily grow your own scented lawn without any grass seed. Use the non-flowering Treneague variety of camomile. You can buy plants - as this variety doesn't seed - but if you have the patience you can buy fewer plants and easily grow your lawn from cuttings. Don't sow grass as well. Simply keep the camomile regularly cut and it will root, branch and thicken up. Try camomile next to a patio, or instead of a garden path. It can be grown between block paving too. The scent from camomile makes a nice edge where your lawn meets a flower border. With a fine lawn grass and when kept regularly cut your camomile should survive grass invasion. Moreover, your spreading lawn camomile can be used to blur the lawn edge with camomile growing in your flower border. For the border you might use ordinary camomile Anthemis nobilis available from seed for its taller pretty scented flowers. People often ask:- what makes the sweet smell of freshly cut grass? Well, Sweet Vernal grass is just as the name suggests; there may be others. But in a herb grass mix, try to include Sweet Vernal grass Anthoxanthum odorata if you can get it. The ultimate disaster when growing lawns perhaps? Yet I actually find growing lawns of moss to be quite attractive. The alternative moss lawn pictured here is at its best in winter. 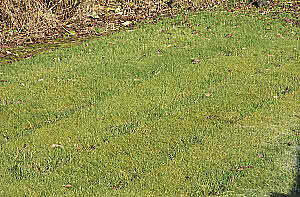 Given sufficient moisture moss lawns can thrive on neglect. So in moist poorly drained or shady areas growing lawns of moss actually offers the big plus of nearly care-free management. Don't forget too that some garden birds use moss to line their nests. And tiny snails - that are food for small animals - will be in abundance. Yet growing lawns of moss may not be so inviting to pests like the leather jacket that turns into daddy-longlegs, and the wire worm that becomes a click beetle. Growing a small area of moss lawn in your garden may help to increase the diversity of wildlife in your garden. Some low growing herbs with a creeping habit and buds at soil level can be made into alternative greens. Although they may not be grown intentionally, I've seen beautiful lawns made from Daisies, Plantains as well as Clover and the like. Bronze and harlequin leaved ajugas like 'burgundy glow' are eminently suitable. Beware with Creeping Buttercup, it is poisonous to animals and kills off the clover. A yellow blanket of buttercup flowers looks tremendous and attracts pollinators. But don't allow it near grazing animals. You may agree that a regular weekly mowing routine is unnecessary - the whole exercise time consuming - a stimulus for growth that removes more nutrients. And the more you mow the less drought tolerant the grass becomes. Well the good news is that a rougher but not unkept utility lawn can be managed by mowing a few times before and after the summer resting period. But the cutting blades must be set higher. You might then reduce mowing from every week, to 4 or 6 times a year. This type of cut is best done with a rotary mower. Your finer grasses will diminish and course grasses take control. In early summer an area of the lawn can be left to flower. If you're planning on growing lawns afresh for this type of maintenance then make it a Grass Wild Flower lawn. But actually I believe it is rather better to feed and mow an organic lawn more regularly. Then you will be able to recycle grass trimming to make a nutrient rich garden compost to feed the rest of your organic garden. The Pasture Lawn consists of course grasses and is grazed by goats, horses or sheep rather than being mown. Bear in mind that these animals have different grass preferences. For this purpose, you should include fodder grasses in the seed mix. This can turn into a pracitical approach when you really don't want to be growing lawns everywhere. Consider pasture for larger areas, when the site is sloping or uneven, with natural surrounds, and when you have children who may benefit from an introduction to animals. Goats also provide good milk. Sun, Shade, Drought, Fire Resistant Grass seed mixtures can be specially formulated for growing lawns in particular situations or for particular uses. So there are grass seed mixes for growing lawns in sun, shade, drought, damp, and for lawns on exposed coasts. In addition there's grass seed for grazing, for tough utility lawns and for your growing lawns into the finest ornamental greens. Fescues are fine leaved and drought resistant, Bent or Brown Top is fine leaved and creeping, traditional Rye grass is tough and creeping. In addition, there are fodder grasses such as the large Fescues and Poas. When seeding or planting a new lawn.... use Kelp Meal. A huge selection of grass seed for all purposes is available on this link. Click to find all the tools and information you need for growing perfect lawns. Click to find suitable lawn fertilizers and how to use them. Use Calcified Seaweed when sowing lawn seed - (approved for organic growing). A professional selection for grass seed is available on this link.